The spectacular series of twenty paintings, The Slav Epic, to which Mucha devoted nearly twenty years of work, had its first foundations in place before the first stroke of the brush. Mucha had been developing the idea of a monumental work devoted to his nation since 1900. However, it was not until 1906 during one of his journeys to the USA (to gain the means to fulfil his dream), did he begin to wonder what exactly it would look like. He drew inspiration from the vast sails that adorned the steam ship on which he travelled. Thanks to this, some of the paintings in The Slav Epic series hold monumental dimensions (the largest being 610 x 810 cm). The chateau in Zbiroh provided the canvas and the painter with plenty of space, becoming the Mucha’s family residence for almost twenty years. Mucha worked tirelessly, sometimes well into the night in his studio, the chateau’s former dining room. Jiri Mucha recalls how, as a boy, he went to his father’s studio to tell him that lunch was ready. Manka was the family au pair, taking care of Mucha’s children, and posed (like everyone close to Mucha) as many characters. For example, Mucha chose to use a local teacher from Zbiroh to pose as George of Poděbrady. For a precise idea of Jan Hus’s stance, he used a photo of himself pictured in the middle of a sermon. 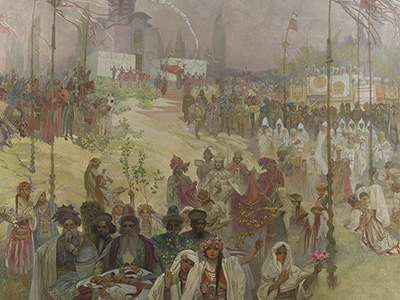 Mucha formed a close relationship with the residents of Zbiroh, and between 1923-1924 he painted a curtain for the local gymnasium. Zbiroh and its surroundings provided the painter with the peaceful backdrop and inspiration he needed to concentrate on his work. Although this didn’t put an end to his travels. He visited Russia, creating a series of photographs of Vasily Blazhen’s Temple, depicting the scene of the Abolition of Serfdom in Russia (1914). He also lived with Orthodox monks on Mount Athos. The Easter of 1924, spent in the Chilandar Monastery, was an unforgettable experience for him, providing inspiration for one of his most impressive paintings; The Holy Mount Athos (1926), No. 17 in The Slav Epic cycle.